Organized ministry for families within the Seventh-day Adventist Church began with the establishment of the Home Commission in 1919. Arthur Spalding, an educator and editor whom Ellen G. White had convinced in 1913 to dedicate his life to the training of parents, served from 1922 to 1941 as secretary of the Home Commission. Through tireless efforts for nearly two decades he and his wife Maud brought recognition and acceptance of family life education within the church in North America and in many countries around the world. The Home Commission became part of the Department of Education in 1941 and during the next three decades marriage and family life programs were promoted by Parent and Home Education secretaries: Florence Rebok (1941-1947), Arabella Moore Williams (1947-1954), Archa O. Dart (1954-1970), and W. John Cannon (1970-1975). In 1975, to address more directly the need for stronger, more stable Adventist homes, the Home and Family Service was organized. A husband and wife team, Delmer and Betty Holbrook, organized and conducted training seminars for administrators, pastors and laity in every world division. A variety of instructional manuals and materials covering a broad spectrum of family life issues were developed. Karen and Ronald Flowers joined the HFS staff in 1980. D. W. Holbrook directed HFS from 1975 to 1982 and Betty Holbrook served as director from 1982 until 1985 when Home and Family Service became part of the Department of Church Ministries. Family Ministries continued as a strong section of DCM through the efforts of D. W. Holbrook (CM director 1985-1987), Betty Holbrook (until her retirement in 1988) and Karen and Ronald Flowers. An infrastructure of Family Ministries associates at division, union and conference/mission levels was developed. 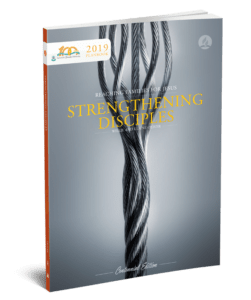 The Family Ministries leadership training curriculum was put in place and major initiatives were undertaken to research Adventist families worldwide and stimulate activity in local churches with annual emphases such as Christian Home Day, Christian Marriage Day and Family Togetherness Day. The current Department of Family Ministries was established in 1995 and led until June 2010 by Karen and Ron Flowers. At the 59th General Conference Session held in Atlanta, Georgia, on Monday, June 28th, Elaine and Willie Oliver were elected as the new Directors of the Department. Learn more about Hope for Today's Families, the Church's sharing book for 2019. Learn More. The Family To Family guides for Church and Family are available now for download here! Real Family Talk with Willie & Elaine Oliver is a weekly 30-minute TV show on The Hope Channel! Watch past episodes or find a station online! Also, visit our Facebook page! Submit your prayer request here.